Hello I am an upcoming sophomore in HS. I run cross country and track for my HS. I've been working hard all summer working on my goal of 17:15 for a 5k. I'm trying to run 5:40-45 mile splits in a 5k. I'm having trouble running that time and end up running an average of 6:10-15 or so per mile. Could you give me some workouts to do so that I can get my splits down to 5:40-45? I have put your PR in the Race Conversion Calculator. Based on your 800m time of 2:12 mins, your expected 1,600m time is 4:35 mins. Based on your 800m time of 2:12 mins, your expected 5k time is 15:20 mins. Based on your 1,600m time of 5:05 mins, your 5km time is 17:00 mins. See what is happening? You are running out of steam. And fast! Your shorter races indicate that you can establish faster times on the longer ones. The problem you have is that your basic speed is alright, but you can't maintain it for a long enough time. This means that you need to do a lot of base running. What it sounds like you are doing in your running training currently is trying to run that 5k at your fastest speed regularly. However, you need to run slower and longer in this summer period. This sounds very counter-intuitive. But just think about this for a second: if you build up your stamina so you can run 8-10 miles quite easily, then running those 3 miles at a faster pace should become easier to do. Now when you consistently do your base running for a longer period of time you may find that in the initial few weeks after changing to faster workouts again (when summer is over), you will be a bit slower than usual. You simply need to re-adjust to running faster runs again. But after that you should be able to go faster for longer and start establishing some PRs. I give away a very good ebook about the importance of running with my Best Running Tips Newsletter. When I was in high school (about 800 years ago ;-) in my 1st and 2nd years I was a mediocre runner. miles/week, lost about 15 pounds (didn't even know it either until I went back to school in Fall and all my friends thought I got cancer!). I actually learned to love running instead of dreading it, and that made the miles really easy. at 16:29 (two seconds under my school's record). The next year I hit 15:58, and in college I hit 14:52! SOOO, all that to say: the long base miles matter! You asked in your comment about advice on how to run a faster 3 miles. I think there is a lot of valuable information on this page already. 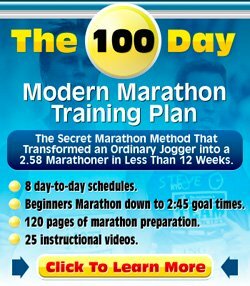 Build that base because your 1 mile and 2 mile time are indicating that you'd be able to run a low 17min 3 miles. Instead you run a 18.34 3mile, showing quite some deterioration. Also see my page about Base Running Drills.